If you see a sign for any of the dishes listed below and the restaurant or stall is busy, try it out. You really cannot go wrong, there is so much good food to be had in this city. If you don’t want to gamble however, below I have listed my absolute favorite places to eat each dish. The best Phở on earth is only 50 meters from my old house. I used to wake up every morning to grab a bowl here. They only serve for breakfast from about 7:00am to 9:30am or until they sell out. 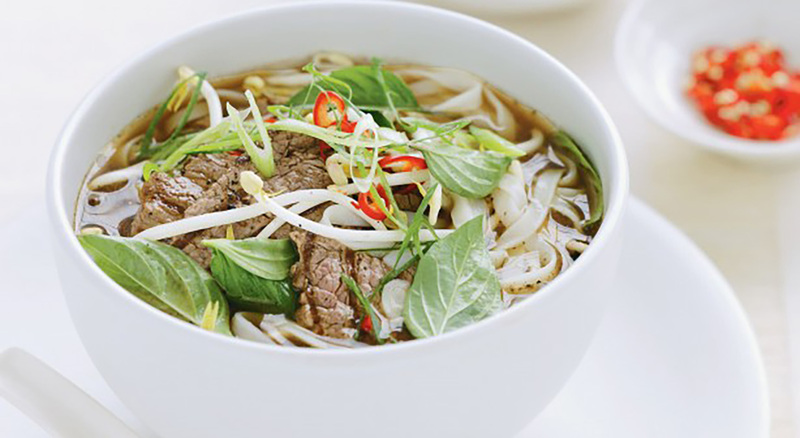 When you come to Vietnam you have to try Phở, it’s probably the most internationally recognizable dish. You won’t find better Phở anywhere. I promise. Cơm Tấm, literally means broken rice, and is made from the rice that is broken during the milling process and is apparently unsuitable for export. I’m not sure why they don’t export it because I wish I could buy the stuff back home. It’s delicious. 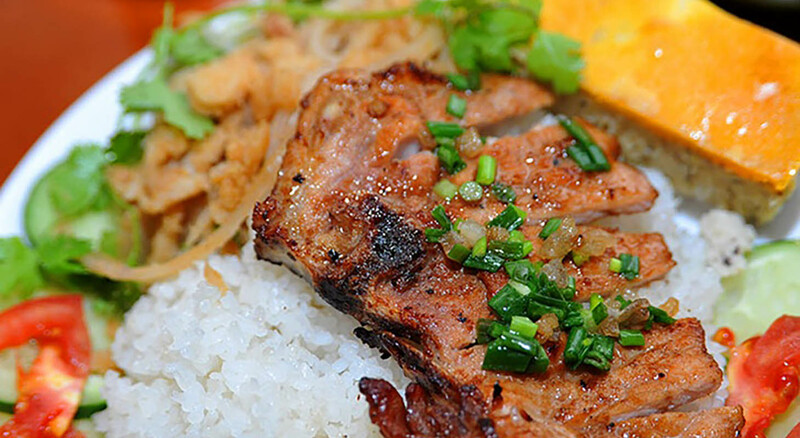 It’s a rice dish often served with marinated pork, pickled vegetables, an egg and sweet fish sauce. Quán Cơm Tấm Nguyễn Văn Cừ below serves the rice topped with lots of sides and a giant steak like pork chop with meat that literally melts in your mouth. The marinade is sweet and smokey. This is going to be one of the best pork dishes you have ever eaten. Bánh Mì is a staple in Vietnamese cuisine especially in the South. 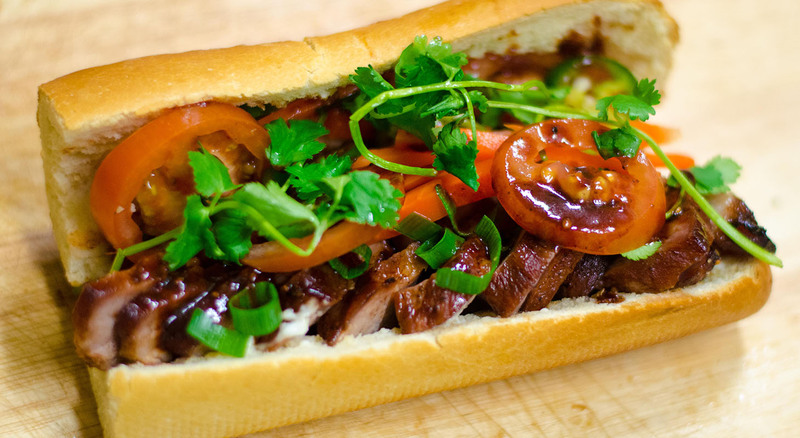 Introduced to Vietnam during French colonization, it’s a baguette, made with both wheat and rice flour. It’s lighter and has a thinner crust than baguettes found in France. Bánh Mì is perfect for travel when you need to pick up food on the run. It’s served with a huge range of fillings. Grilled meat (Bánh Mì Thịt Nướng), cured meats (Banh Mì Thịt Nguội ), eggs (Banh Mì Op là) you name it. My personal favorite is Bánh Mì Heo Quay, a baguette stuffed with pickled vegetables and roast pork belly. My favorite place is operated at the front of a bakery, the bread is often fresh out of the oven, the ingredients are measured to precision and it’s topped with a slightly sweetened Nước Mắm source. 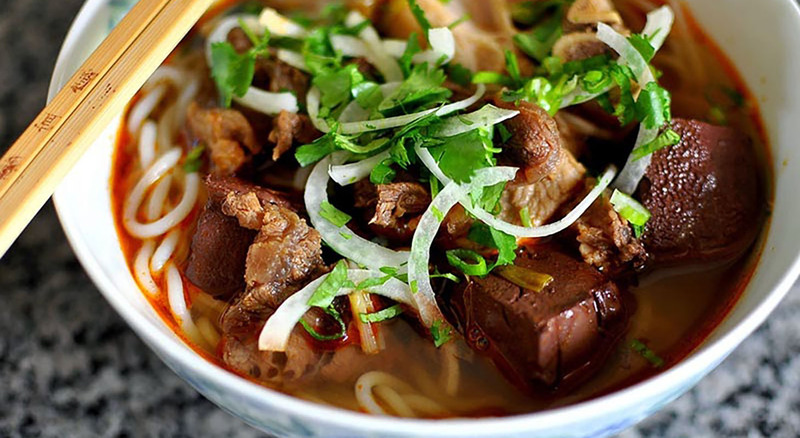 Bún Bồ Hue is a beef noodle soup originally from Hue the center of Vietnam. Its packs a lot more punch than most other noodle soups such as Phở. The noodle itself is the fat round bún noodle and the stock is extremely complex with loads of flavours going on. Typically very spicy and oily. It contains a wide range of beef cuts, herbs and vegetables. In my opinion this dish is way up there in the Vietnamese noodle soup power rankings. 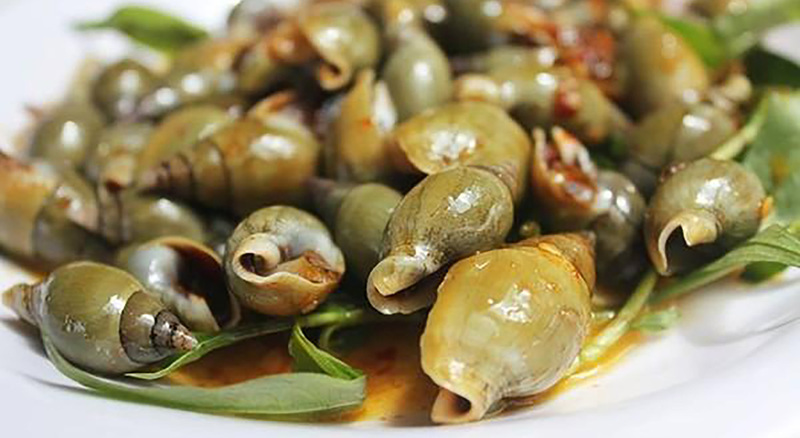 Ốc restaurants in Vietnam serve grilled shellfish and sea snails. 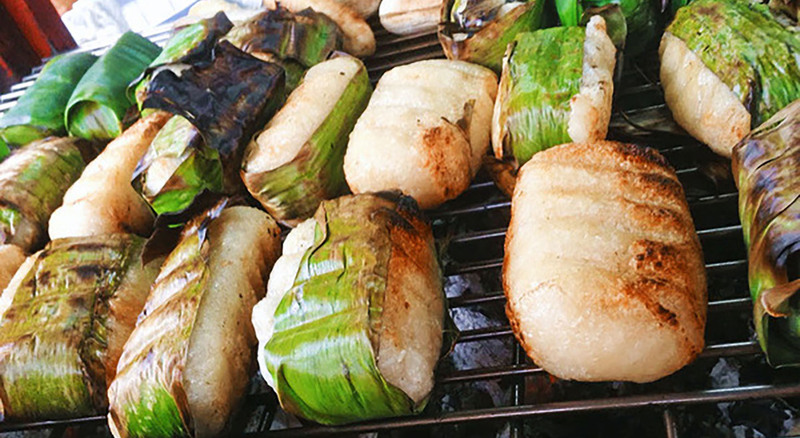 They come grilled in oil, shallots, are topped with peanuts and pork crackling and come served with a salt, pepper, lime and chilli dipping sauce (Muối tiêu chanh). This place is my favorite place to try it for a few reasons. It’s tucked down a fun little mini maze of alleyways but not too hard to find. Once you get there it can be a bit of a mad house. You enter into a giant courtyard with cars parked to the right and a sea of people, plastic chairs and low set aluminum tables to the left. It’s noisey and chaotic, but it all adds to the completely electric atmosphere. Don’t be surprised if you only get given half of what you order it’s just how it works here. You only get charged based on the number and colour of the plates on the table at the end of the night. Order a range of shellfish and snails (they should give you a book with picture to point to). The combination of cheap beer, hot bread rolls, grilled shellfish and atmosphere makes this place a complete favorite of mine. If I had to recommend just one restaurant in Saigon, this might be the place. Chuối Nường is my favorite Vietnamese dessert. It’s a small sweet lady finger banana, battered in rice and grilled in banana leaf. It’s chopped up and served with coconut custard. I’m not huge on Vietnamese desserts but I’m crazy for Chuối Nường. 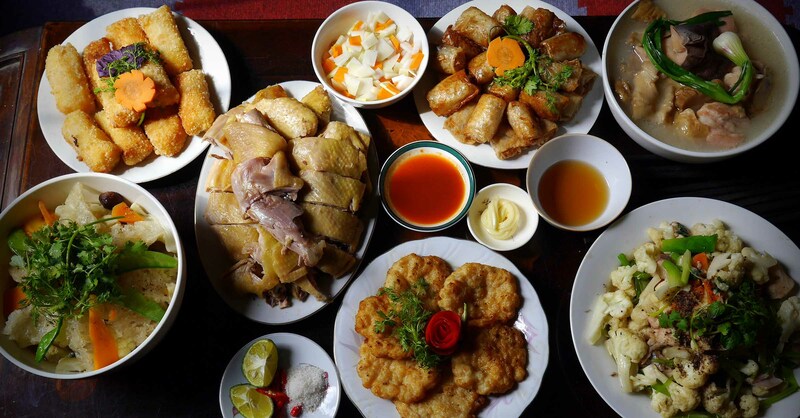 When families in Vietnam eat, there are typically quite a large number of dishes served and everything is shared by the entire family. It’s a great way to eat as you get to sample a lot of different things. Both Secret Garden and Cuc Gach Quán serve food this way. Its perfect for a nice dinner. Cuc Gach Quán is a little further out of the central area but has a nice family home feel. Secret Garden is closer in. It features a gorgeous rooftop with more of a rustic feel.